Yes, ketemu lagi sama hari Rabu. Saatnya ngayal untuk memiliki buku-buku incaran. An inspiring story of how a Mormon kid with Tourette’s found salvation in books and weight-lifting Josh Hanagarne couldn’t be invisible if he tried. Although he wouldn’t officially be diagnosed with Tourette Syndrome until his freshman year of high school, Josh was six years old and onstage in a school Thanksgiving play when he first began exhibiting symptoms. By the time he was twenty, the young Mormon had reached his towering adult height of 6’7″ when–while serving on a mission for the Church of Latter Day Saints–his Tourette’s tics escalated to nightmarish levels. Determined to conquer his affliction, Josh underwent everything from quack remedies to lethargy-inducing drug regimes to Botox injections that paralyzed his vocal cords and left him voiceless for three years. Undeterred, Josh persevered to marry and earn a degree in Library Science. At last, an eccentric, autistic strongman–and former Air Force Tech Sergeant and guard at an Iraqi prison–taught Josh how to “throttle” his tics into submission through strength-training. Today, Josh is a librarian in the main branch of Salt Lake City’s public library and founder of a popular blog about books and weight lifting–and the proud father of four-year-old Max, who has already started to show his own symptoms of Tourette’s. 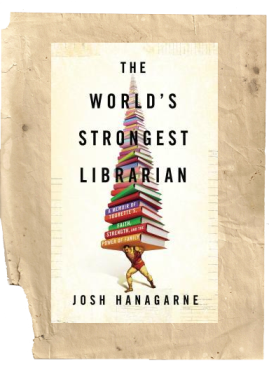 “The World’s Strongest Librarian” illuminates the mysteries of this little-understood disorder, as well as the very different worlds of strongman training and modern libraries. With humor and candor, this unlikely hero traces his journey to overcome his disability– and navigate his wavering Mormon faith–to find love and create a life worth living. Baca sinopsisnya sih bikin penasaran. Gue suka baca kisah tentang Amish, Mormon, dan kaum minoritas dengan segala keunikannya. Dan pas lihat ratingnya di Goodreads sih lumayan tinggi. Tambah bikin penasaran. Seperti biasa, yang mau berpartisipasi dalam bloghop Wishful Wednesday, silahkan mampir ke blognya Astrid di sini ya. 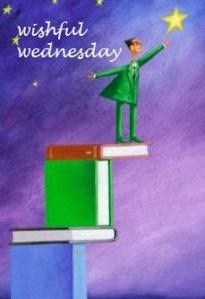 Posted on May 8, 2013, in Uncategorized and tagged book, memoir, non fiction, Wishful wednesday, wishlist. Bookmark the permalink. 8 Comments.